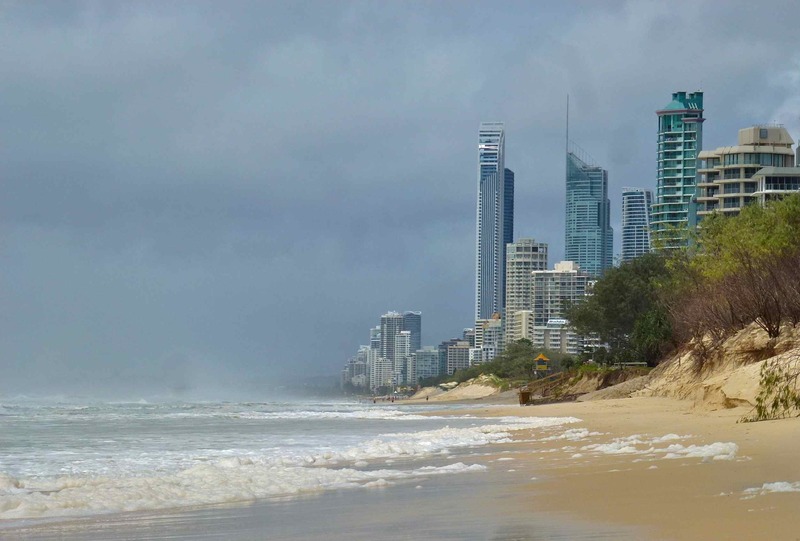 A roaring storm is rolling in to hit the sandy white beaches of Surfers Paradise in Queensland, but as the sun is still shining the Boyfriend and I are going to beat it before it hits. Having just arrived in Australia we discover two rickety bicycles in the garage below our rented apartment at Biggera Waters. We are itching to explore the area and the bicycles look as if they need to be dusted off and taken outside for some fun! A cycle path sits right below our apartment weaving its way beside an expansive inlet which heads in both directions, but before we begin we cycle to a local petrol station. The bicycle wheels are in need of some good ol fashioned air. The bicycles creak and the chains squeak happily along the cycle path. There is no rush. The sun warms our backs as the sea sprays its salty scent in our direction. We pedal through quiet grassy parks dotted with spiny trees. Clusters of colourful boats lay like empty seashells on the sandy shoreline. A random fisherman stands hunched and crumpled in the shadows of the on coming clouds as we continue to pedal in the direction of the high rises of Surfers Paradise. With faceless apartment blocks on one side and the vast inlet on the other you feel as if you are never too far from it all. A big camp ground sits right next to the inlet as we pedal over a bridge and into a sizeable park. It is all very serene. Only the odd jogger and elderly walker uses the open space to their advantage. 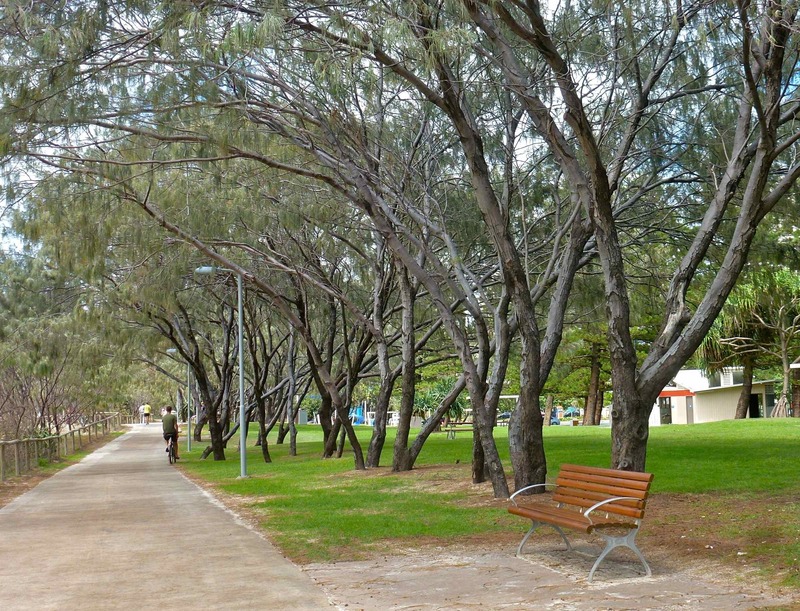 We cycle upon Broadwater parklands. 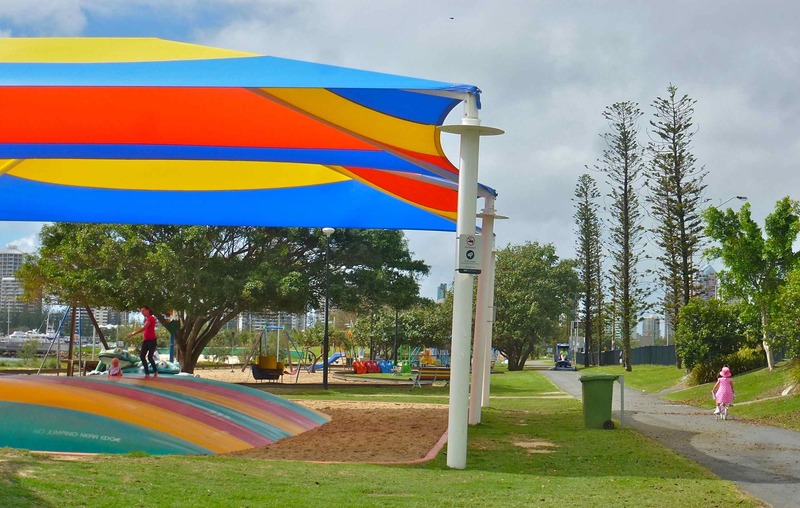 It has a delightful children’s playground complete with an enormous bouncy tarpaulin that resembles a colourful pillow! I simply can’t resist the chance to play on all the equipment that bounces, spins, rocks, twists and turns… We stop, becoming kids again and time simply becomes obsolete. A gentle breeze begins to blow as we climb back on our bicycles. In the distance crazy distorted shapes appear… They are the curves of a unique water park. The shiny mosaics glisten under the small spurts of water. Constant flows of water create a stream for children to paddle in. If only we had our brought our swimmers! 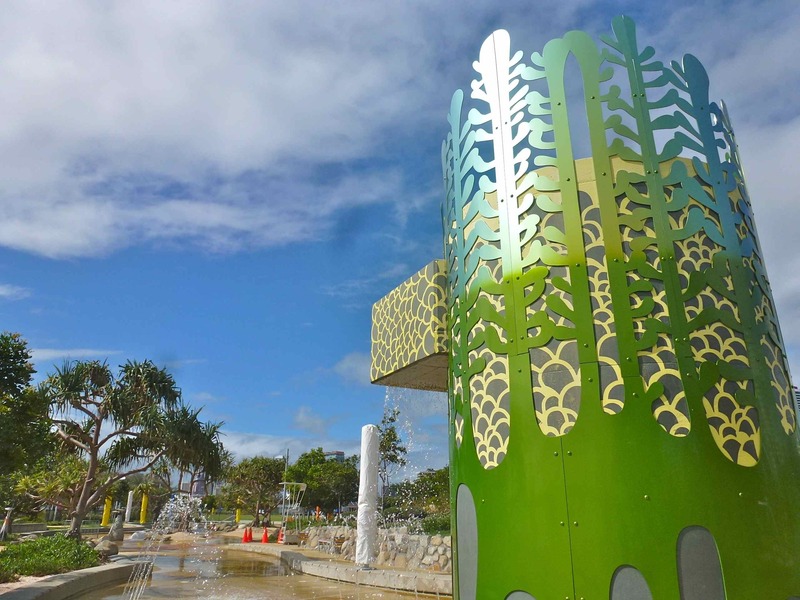 An interesting children’s cycle park catches our eye with its little ramps and stop & go signs. This place is a child’s paradise! 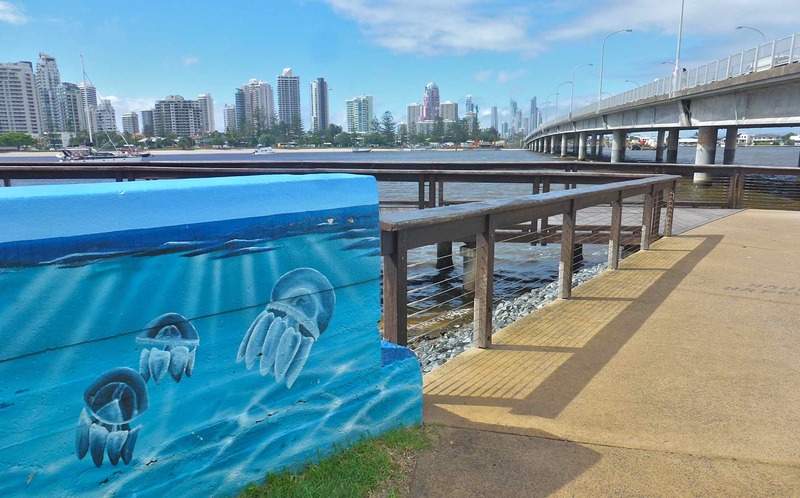 The cycle path guides us safely onto the busy Gold Coast highway and over the inlet via a lengthy bridge – We hoot and holler as we are carried along by the speed of cars and trucks whipping past us. From above we would resemble ants as we take a small detour below the towering apartment blocks. It is a quieter route which eventually guides us to a path right next to the ocean. Sadly, the clouds have finally gathered momentum and begin to look menacing. 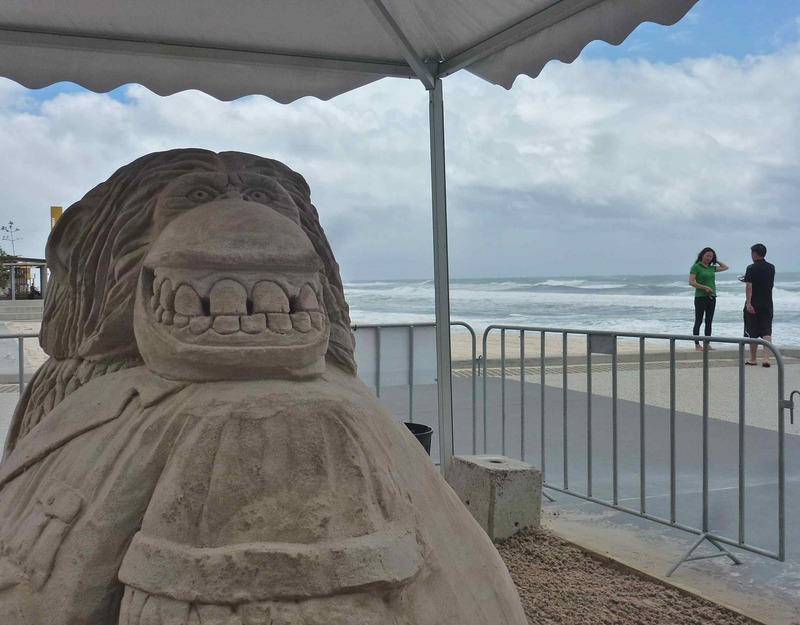 Surfers Paradise greets us with a busy promenade full of people, a row of crumbling sand sculptures and a maze of shops and eateries… The place doesn’t hold our attention for long and the rain begins drizzling. We quickly turn back into a strong breeze pedalling back to the shelter of a surf club. Once inside we have a comforting bite to eat. The rain falls intermittently. We are mesmerised by the huge ocean waves powerfully beating up the fragile golden sands. Dragging the delicate sand into its wild depths and leaving frothy white foam behind. Finally we decide to make a dash for it. The brave bicycles groan and creak under the strain, but they get us back to the warmth and shelter of our apartment just in time! The storm hits with the force of a roaring lion. 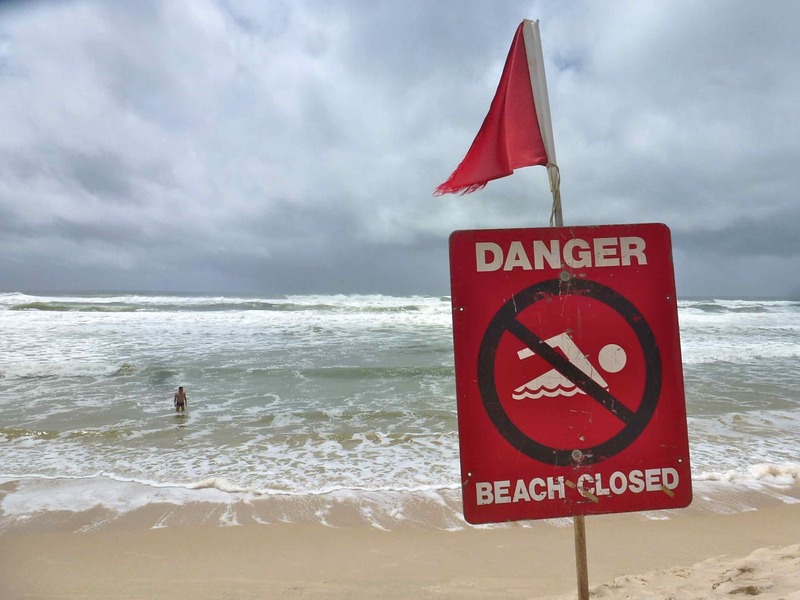 Untamed it closes all the beaches, closes the National parks and eventually floods many of the coastal roads south of Surfers Paradise. Thank goodness we are heading north next. 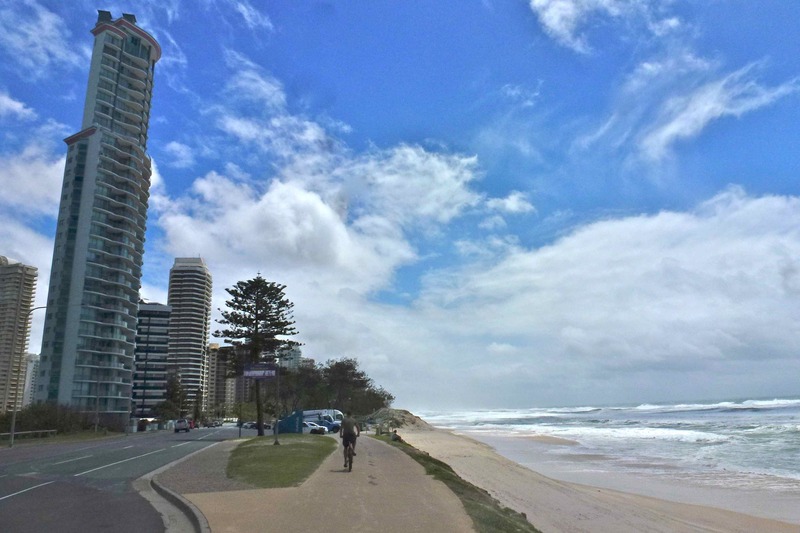 This entry was posted in Australia, cycling and tagged Australia, bicycle, blog, cycling, Gold coast, nature, photography, Queensland, Surfer's Paradise, travel, weather, writing. Bookmark the permalink. Love the pictures (and the prose): thanks for taking the time to post this. Great photo’s! Have you tried cycling south right down the coast for a few days? I really enjoy the south east Queensland coast and right down into northern New South Wales..
Nice riding time, won’t get tired out there. I’ve never ridden the bike up there, so thanks for the tour guiding. 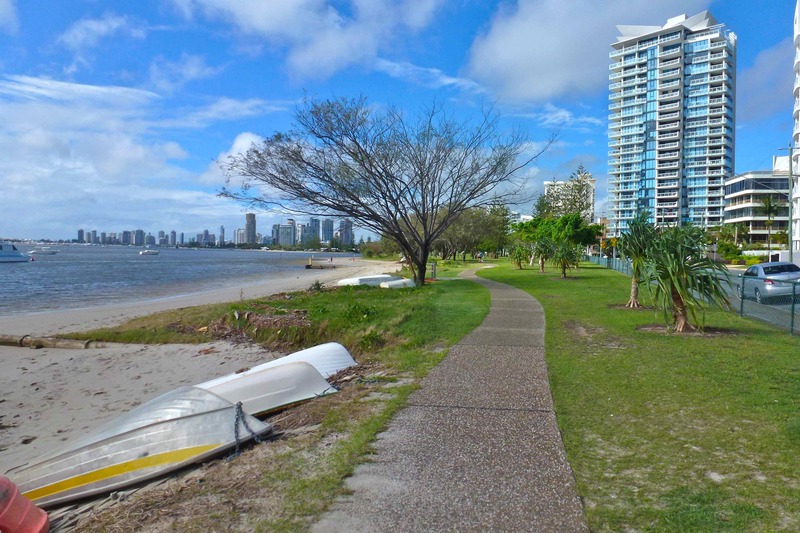 I’m very pleased to hear there is a cycle path of sorts – Queensland has really made cycling a priority, though Brisbane has a good (and as yet underused) city bike scheme. Will follow your progress! Certainly was… If only the niece and nephew had been with us! 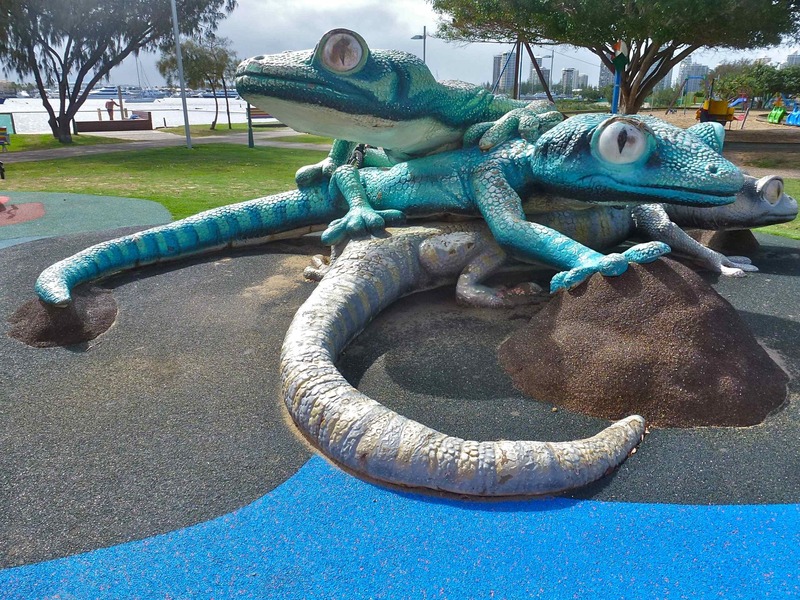 They would of loved the colourful playgrounds. Good to hear from you.